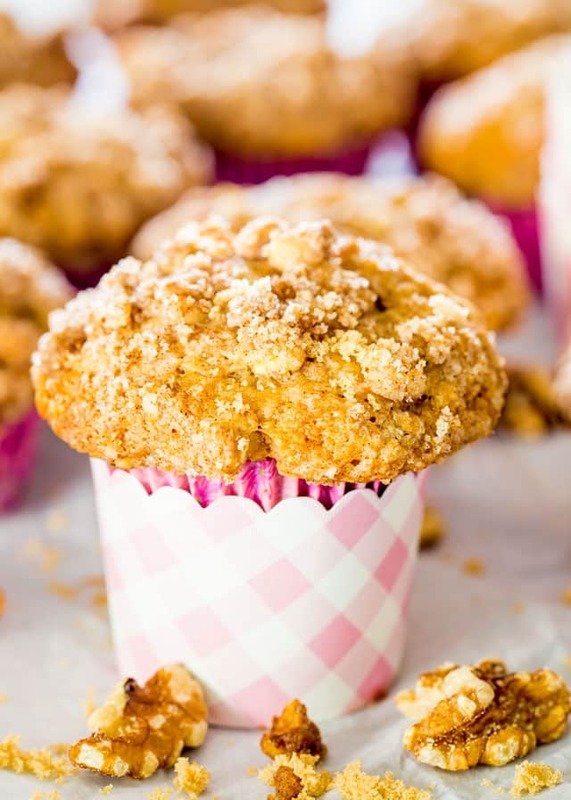 These Apple Coffee Cake Muffins are the perfect treat to surprise your mom on Mother’s Day. Pieces of tender apples and walnuts in every bite, plus a delicious streusel topping. You know what I haven’t made in a very long time? Muffins! And while I was sitting here contemplating what recipe to give you guys next, I decided that muffins are the perfect treat. It’s simple enough to make and it’s something that goes great for breakfast or brunch. Not to mention something that these would go great with a good cup of coffee. While these gorgeous muffins may seem like a bit of work, it’s worth all the effort, my friends. You just have to trust me on that. It’s like a coffee cake but in a muffin. 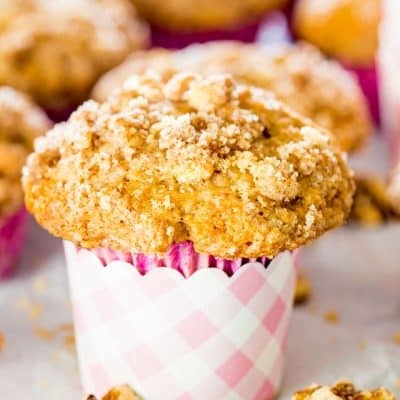 They’re just perfect with apples and walnuts in every single bite, not to mention that delicious streusel topping with brown sugar, walnuts and cinnamon. I also made a simple glaze to go with them and while I feel that for me the muffin is sweet enough without the glaze, I know some of you will appreciate it. After all you just need a little bit of a drizzle. While normally in coffee cake there’s sour cream, I decided to go with apple sauce here for that extra apple flavor. 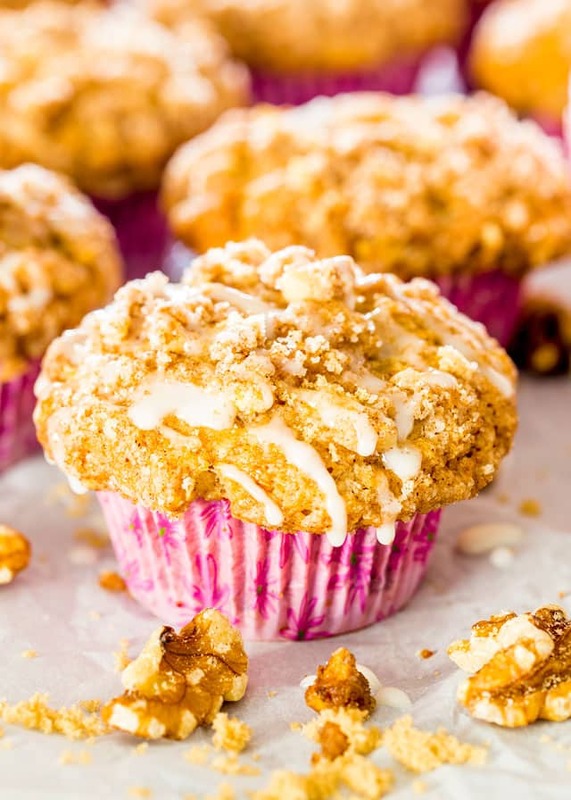 If you want a slightly healthier muffin, you could use whole wheat flour instead, and perhaps even cut down on the sugar to 1/2 cup instead of 1 cup. These apple coffee cake muffins are super easy to make loaded with all kinds of good stuff. I love making these over the weekend because not only do I get to enjoy them on the weekend but I have breakfast for the whole week. They’re great, delicious and super versatile! Absolutely! Muffins in general freeze perfectly. I love to wrap mine in individually in plastic wrap then place them in a ziploc bag and store them in the freezer. Make sure to cool them first completely. They will last for up to a month in the freezer! 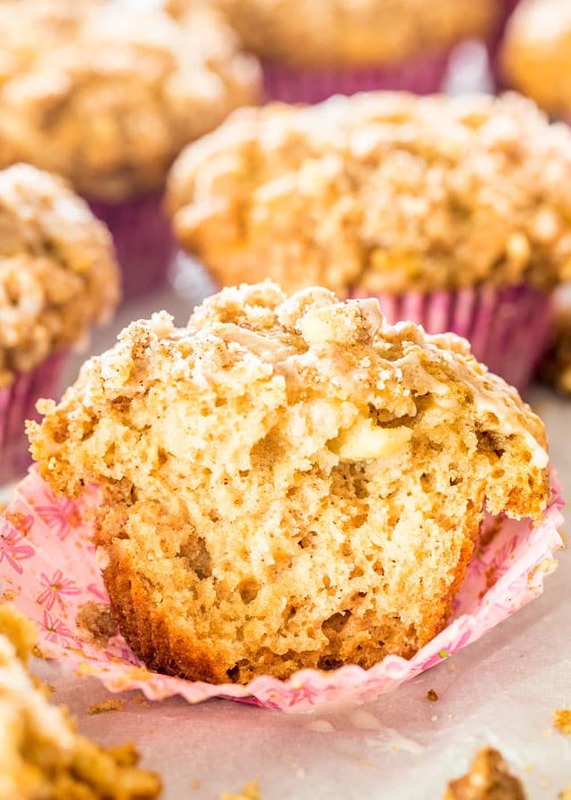 These Apple Coffee Cake Muffins are the perfect treat to surprise your mom on Mother's Day. Pieces of tender apples and walnuts in every bite, plus a delicious streusel topping. Preheat the oven to 350 F degrees. Line a 12-cup muffin-tin with paper liners and spray each liner with a bit of cooking spray. This will make it easier to remove the liner from the muffins. In a medium bowl, combine the walnuts, brown sugar and ground cinnamon. Set aside. In a large bowl, combine the flour, granulated sugar, and salt together. Add the cold butter to the bowl and using a pastry blender or two knives, cut the butter into the flour mixture until pea size. Remove 1 cup of this mixture and add it to the streusel walnut mixture and combine. Add the baking powder and baking soda into the flour mixture and whisk to combine. In a small bowl whisk together the apple sauce, egg and vanilla extract. Pour this applesauce mixture over the flour mixture and stir until just combined, do not over mix. Take 3/4 cup of the streusel mixture and add it into the muffin batter, and stir until combined. Gently fold in the chopped apples. Add the 2 tbsp of melted butter to the streusel topping and stir until streusel resembles a crumble. Divide batter among 12 muffin cups, I find that it's easier to do this using an ice cream scoop. Sprinkle generously with streusel topping, crumbling with your hands to make some big chunks. Bake for 25 to 30 minutes or until a toothpick inserted in the center of muffin comes out clean. Allow to cool in the pan for 10 minutes, then transfer to a wire rack to cool completely. While the muffins are baking you can make the glaze. In a small bowl add the icing sugar, milk, and vanilla extract, then whisk everything together. Drizzle over muffins. *Nutritional Information does not include glaze. **You can substitute sour cream for the apple sauce. Store the muffins in an air-tight container in the fridge for up to a week, or 2 to 3 months in the freezer. You can use whole wheat flour in this recipe. Since it's slightly more dense, use 1 3/4 cup of whole wheat flour instead of 2 cups. You can use any variety of apples that you prefer. Jo your muffin recipe is fantastic. I decided to give your recipe a try and your muffins are so wonderful. This is the first muffin I’ve tried that I like so haven’t bothered due to disappointment. My husband who is so picky loved them as did my stepson. The only thing I did different was I cut the sugar back to 3/4 cup and left off the drizzle. I’m impressed with you and your many recipes. You don’t cook 24 hours a day do you? Just kidding. Ha! Nope! 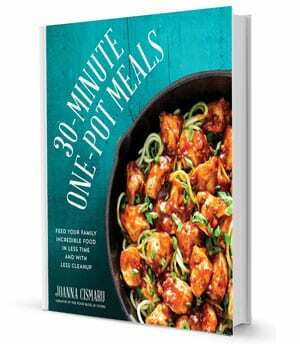 I started this blog over 9 years ago, so plenty of time to accumulate all these recipes. 🙂 Glad you like the muffins! WOW!! I love these muffins. I made them as per instructions and cut the sugar in half, as was mentioned in the description of muffins. They are exceptionally good. I love apples and have one every day with breakfast. I had two soon after baking and had to force myself not to eat anymore. Now to put them in the freezer so I don’t eat them all in one sitting. Thank you Jo for this wonderful recipe. How Do I make this eggless? Can you send me a recipe? Check out this article on replacing eggs in baking! Hello, I have tried many, many muffins but these are by far my favorite. The taste is excellent and I often add other fruit as well, like blueberries and strawberries in addition to the apples. Thank you so much for a wonderful recipe, my family loves them! It depends how much of the sugar you’re cutting down. Just a little bit won’t have any adverse results. As recommended in this post will cutting the sugar by half have sny adverese effetcs? Not really, it should be fine. Quite often I cut the sugar in half in many baking recipes, only because I don’t like cakes or muffins that are overly sweet. Fabulous muffins, came out exactly as described. The only thing I did differently was to use plain greek yogurt instead of the applesauce, and added more walnuts. Delicious! Yogurt is a wonderful substitute. Glad you loved the recipe! It’s a regular 12 cup muffin pan, here’s the one I use. Um, can I eat these for breakfast for, like, the rest of my life? They look SO perfect! You rocked this recipe! Thanks so much Karly. Love your commenting and yes you can certainly eat t for breakfast anytime. 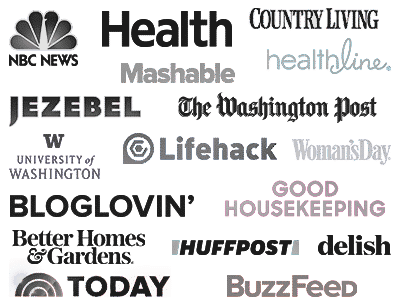 Thanks for being a part of Jo Cooks. Made these yesterday. They were delicious….but I would tweek the recipe just a little by adding more walnuts. I also used gala apples which are sweeter than granny’s. I couldn’t resist when they came out of the oven and ate two while they were still warm. 2 tbsp is correct, you have 1/2 cup walnuts and 1/4 cup brown sugar too, so 2 tbsp isn’t that much really. I took out 1 cup of flour super butter mixture add onto the streusel mixture…..then took out 3/4 into the muffin batter….then not much left actually…..!!!…oh! i am confused… BUT, whatever….the muffins taste wonderful! These muffins look absolutely irresistible, Jo! I will certainly give these a try! Pinned and Yummed! Oh YUM! That streusel topping looks amazing!